If you have a young family to educate and live in Torbay, South Devon in the south west peninsula of England, you are very fortunate for more than geographic reasons. ALL FEES fall due on the first day of term and must be paid by then unless other arrangements are in place. A 5% SURCHARGE is added to fees paid late. FEES are charged termly, that is three times each year. Payment of fees is by Direct Debit. Monthly direct debits are subject to a surcharge. Speech & Drama, Music, Dance & Tennis lessons are not invoiced by the school but by the Drama / Instrumental / Dance / Tennis teacher. For further information about lessons, please ask at the school office. Our list of charges is not comprehensive, however, charges for the following are announced when appropriate: residential trips, singing lessons, musical instruments and music books, tennis coaching and school text books which are lost or damaged by pupils. Due to the additional care and attention provided for children under 2, and the consequent high staffing ratio, fees for children of this age are as below with the addition of a 20% surcharge. Group Swimming – with swimming coach (Penguins & Cygnets) £60.00 per term. To find the fee appropriate for your child’s attendance please see the table below, for example, for three mornings including lunch, see Morning + Lunch column and go down to Termly Charge for one session and times it by three e.g. 3 x £332.75 = £998.25. Two Full Days each week for a term would be 2 x £481.25 = £962.50. etc. FEES FALL DUE on the first day of term and must be paid by then, unless other arrangements have been made. Payment options are available – please see the School Administrator. A 5% surcharge is added to fees paid late. The minimum attendance for children in Abbey School Nursery is 2 sessions weekly. If you have any further questions regarding Abbey School Fees you may find the answers in our FINANCE FAQ’s section. Until just over a year ago our inspection authority used to be OFSTED. We then joined the IAPS (the Independent Preparatory Schools Association) and fell under the remit of ISI (the Independent Schools Inspectorate). Ofsted do not publish the results of independent prep schools, but ISI do, and we have discovered that our Key Stage 2 (Year 6) SATs results from 2016 have catapulted us directly into the Top 100 Preparatory Schools in England, at position 64, as published in the Sunday Times of 19th November 2017. This includes all preparatory school and all junior departments of Public School that sit SATS. Come and visit us and see for yourselves the wonderful facilities and excellent teaching that support this remarkable fete! The attainment of pupils is consistently above the standards expected nationally and all, including those who are disabled or have special educational needs, make strong progress from their starting points. Teaching is consistently good and some is outstanding. Teachers have high expectations and form excellent relationships with their pupils right through from the Early Years Foundation Stage. The curriculum, based firmly on the National Curriculum, meets pupils’ needs and provides a rich experience as well as promoting excellence in reading, writing, communication and mathematical skills. Behaviour is outstanding and no time is lost in lessons, where pupils are eager and enthusiastic learners. They are consistently thoughtful, kind and supportive of one another, and develop an excellent understanding of how to keep themselves and others safe. Download and view the latest full Ofsted report. To view more detailed Ofsted information click here. You can also view the DfE School Performance Tables website. In September 2016, Abbey School Nursery was inspected by Ofsted, and received an overall rating of GOOD. For ‘Personal Development, Behaviour and Welfare’ we were rated as OUTSTANDING. My child has enjoyed being in nursery from day 1. He never wants to come home! Abbey Nursery is more than just 'childcare', as a parent I appreciate the consistency and experience of the teachers, and they way they really get to know the children as individuals, working with you as a parent to ensure the very best for each child, whatever their needs or abilities might be. For us as parents, Abbey has made memories to cherish from the daily written descriptions of what Andrew has been up to, to cheering him along on his first sports day and on stage in the nursery play. Abbey nursery is, quite simply, a very special place. We are very pleased with the high standard of teaching and organised curriculum of Abbey school and would highly recommend sending your child to the school. The personalised learning style at Abbey school helps all of the individual needs of each pupil. Our uniform list is available separately and copies are available from the school office. 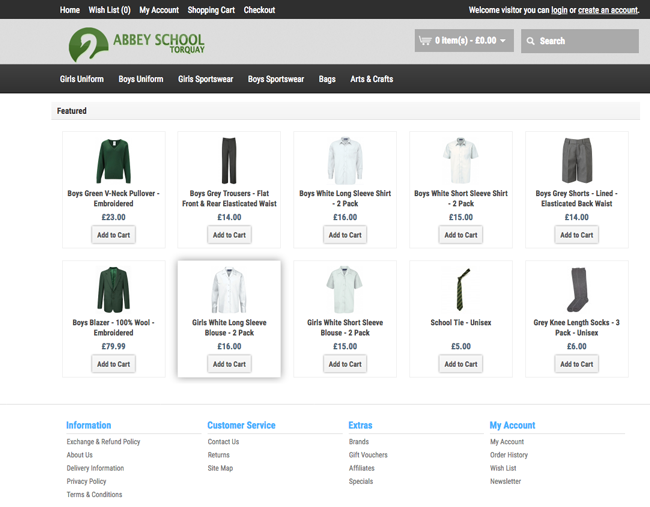 Our school uniform is now available to purchase from our online uniform supplier. Uniform lists have already been emailed to parents.Our uniform is serviceable and practical. Compliance is strict and any infringements will be brought to your attention. Please note: Any prolonged non-compliance to uniform items will result in these items being purchased on your behalf and the cost added to your account. Abbey School lunches are made in-house by our Catering Manager who has been creating lunches for our pupils in Abbey School and Holiday Clubs for over 25 years. He really knows what children enjoy! To give them the energy they need for the afternoon sessions it is very important that children eat at lunchtime, rather than simply push food around their plates. That is why (with the noted exception of ‘chips’ and the unspeakable ‘turkey twizlers’, which we have never served) we offer food that children enjoy eating. Weekly menus, that over time have become proven ‘hits’ with our pupils, are published on the school notice boards. 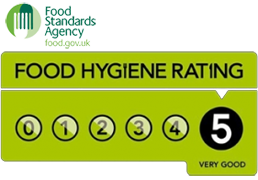 Following a recent inspection In September 2016 the School has been awarded a 5* Rating by the Food Standards Agency for the quality of our food, hygiene of our kitchen areas and training of our catering staff and food handlers. We are very proud of our 5* rating and continue to uphold only the very best standards in this area, ensuring that all Abbey School children receive high quality nutritious meals daily. Our catering team are pleased to prepare separate dishes for children with particular dietary, social or religious requirements and if such matters affect your child, please come into school and discuss your specific needs with our catering manager. If we are not already aware of your particular requirements or how to prepare the special meals that your child needs, for the benefit of your child we are very happy to learn from you, so call in and discuss what is needed and work with us until we can confidently provide your child with what is required. If you can do it, we can do it, even if we might need your help for a while at first.